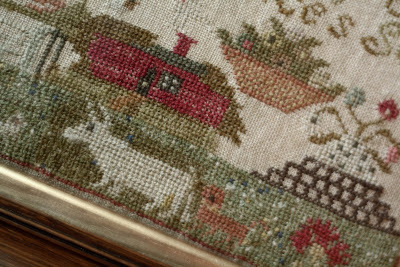 With thy Needle & Thread: See that cow? (love her name, by the way). is on it's way from model stitcher, Susanna. is taking me longer then I expected. Love all the reproduction samplers. Can't wait to add these 2 to my collection. Thank you for your time in reproducing them, it is greatly appreciated. Can't wait to see the new charts - LOVE that short legged cow! As a person with short limbs I definitely identify with this poor creature - LOL! Happy stitching! Glad to hear that the charts are almost ready Brenda. And you wouldn't want to run out of things to do, would you?!? More and more I'm being drawn to these reproduction samplers. I can't wait for these charts to be released so that I can give one a try! Birds of a Feather, the finish!